Maria Vinogradova joined LALIVE in 2013. Her main areas of practice are domestic and international litigation and white collar crime & compliance. She is a member of the Geneva Bar Association and of the Swiss Federation of Lawyers. 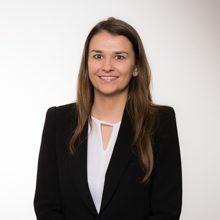 Before joining LALIVE, Maria Vinogradova trained with Cramer-Salamian, (2011-2013) where she practiced civil and criminal litigation in contractual disputes, asset recovery and insolvency proceedings with respect to both domestic and international matters. Maria Vinogradova holds a Master of economic Law (2011), as well as a Certificate in Transnational Law from the University of Geneva (2011). She also holds a Certificate of Advanced Studies in Legal Professions (2011).